Pastor Sater in front of "The Scandinavian Church" as it was called in 1928. Imagine a vast forest, split by a river, with an occasional marsh, a few log cabins, a dam, a woolen mill, several gristmills and small foundries. This was the settlement known as Lansing during the 1840’s. With a lumber boom and the location of facilities in Lower Town (now known as North Lansing) around the dam, this area was the primary business district until the time of the Civil War. When the lumber boom tapered off and the economy crashed in 1893, community life began to focus around Center Town (near the newly established state capitol) and, after the development of a mineral springs spa and resort, Upper Town (Washington Avenue and Main Street near the convergence of the Grand and Red Cedar Rivers). Around the turn of the century, shoppers had to visit a meat market, bakery, grocery and produce stand to buy things found in a one-stop modern supermarket. Lansing boasted 17 meat markets, 5 dairies, 51 grocers and 16 bakeries. The ice dealer was an essential part of city life. Without mechanical refrigeration, the icebox kept food cold in the home and chilled the beer in restaurants and saloons. The Hotel Downey, located about three blocks from the Capitol, was recognized as Lansing’s finest. The Downey cost $2.00 - $3.50 per night when Lansing’s other hotels were charging $1.00 - $1.50 per night. Baird’s Opera House, located at Washington Avenue and Ionia Street, presented opera, melodramas, rollicking Irish comedy and blackface minstrel shows. High school commencement took place at Baird’s. Seating capacity was 1,500. Lansing’s working class went to the Star Theater for entertainment. Tickets were $.10 - $.30 compared to $.25 to $1.00 at Baird’s. The Star could seat 800. General clothing stores sold items for men, women and children. Tailors sold men’s clothing, milliners sold custom or ready-made hats, and dressmakers made custom frocks for women, many working out of their homes. Sewers could purchase fabrics and notions at local dry goods stores. A man named Ransom Eli Olds built his first car in a Lansing garage in 1897. R.E. Olds built 4 vehicles in 1897. Skeptics thought his horseless carriage business would fail and friends even encouraged Olds’ wife, Metta, to leave him. After all, Lansing was a town built on agriculture. Most figured it would remain that way. In December, 1901, a new Olds auto factory opened. The Olds name, later changed to Oldsmobile, became the oldest in North America. The Olds Motor Company made about 2,500 cars per year in the early 1900’s. The Curved Dash, weighing 650 pounds and selling for $650.00, was the most popular model. By 1917, Oldsmobile was one of America’s top sellers - 21,800 cars. Workers made 50 cents per hour, compared to current times when workers make about 400,000 cars per year and the wage is about $22.00 per hour. The United States continued to grow. During the late 1800’s and early 1900’s many western states were admitted to the Union: Colorado, South Dakota, Montana, Washington, Idaho, Wyoming, Utah, Oklahoma and Arizona. Although World War I had been raging for about 3 years, the United States remained neutral until April, 1917. Woodrow Wilson was sworn in for his second term as president. The Panama Canal was about three years old; the disaster of the sinking of the Titanic had happened 5 years previously. The Wright Brothers flight was written in history in 1903. In November, 1917, Lenin led the October Revolution, setting up a Communist organization in Russia. In December,1917, the 18th Amendment to the constitution, prohibiting the manufacture, sale or transportation of intoxicating liquors, was approved by Congress. In 1919, the Treaty of Versailles ended World War I. As Lansing grew from a small dot in the vast wilderness to a manufacturing center, large open space was acquired for parks. One such acquisition was land for Potter Park Zoo and Park, founded in 1917. The REO Clubhouse was built in 1917 and became the cultural hub of Lansing, hosting free movies, wedding receptions, basketball games, dress balls and patriotic gatherings. It was home to Lansing’s first radio station, WREO, which went on the air in 1921. Known as the “Temple of Leisure”, the building comprised a 2,000 person capacity dining room, an auditorium, a library, four bowling alleys, a fireproof movie booth, and smoking lounge and billiard rooms. During the period 1820-1920, over 1,000,000 people from Sweden emigrated to the United States. Danish immigrants numbered 300,00 and the Norwegians 730,000. Unemployment in Denmark resulted in the increase of immigration to the New World. The number of Norwegians in the United States amounted to a figure larger than 4/5 of the entire population of Norway. This meant that Norway had lost a larger proportion of her total population by immigration to America than any other European country except Ireland. Virtually all Swedes who arrived in the U.S. were members of the Lutheran Church. Swedes were legally born into the State church and could only leave by taking formal action. It is not surprising that early settlers in the United States soon began building Lutheran churches. The Luther League organized on November 23, 1917 with 18 members and 23 members organized the Ladies Aid Society on November 24th. On November 25, 1917, the congregation was officially organized as the Evangelical Lutheran Scandinavian Church and the articles filed with the State of Michigan for a $5.50 fee. The pages containing the record of charter members have column headings asking “Where Born”, “Arrived in America”, and “From place and country”. Most of the listings indicate that the new church members were of Scandinavian origin, arriving in the U.S. from the 1870’s to 1920’s. The first marriage took place on September 25, 1918. The bride was 18 year old Tora Elge and the groom was 23 year old Harold LeClear. Three baptisms were performed in 1918. Rev. Sater accepted the call from the Augustana Conference and began work as the resident pastor in August 1918. The Conference paid his salary, one half of which went for rent. Pastor Sater had no car. He walked or rode a bicycle. Additional members were sought throughout the city. Sunday morning services were held in the Seventh Day Adventist Church or at the Maccabees Hall; weekday services were held in the homes, many times with worshipers sitting on planks on boxes. Services were spoken in Swedish or Norwegian. By July 1919, a meeting was held to consider purchasing property for a church building. The Ladies Aid made the down payment. In December, 1918, their first fall festival was held in a empty auto sales room on North Washtenaw that Mr. Lindell had vacated. The festival netted $90.00. Lunch was served for $.20 and handmade fancywork and baked goods were on sale. Each year thereafter, there was a fall supper and sale. Five lots, located at the corner of North Logan and West Lapeer Streets, were purchased for $6,000.00. Basement excavation began October 16, 1922. On August 12, 1923 the cornerstone was laid with the following contents: the name of President Warren Harding, his death and burial, President Calvin Coolidge, the name of the mayor and city officials of Lansing, the governor of the state of Michigan, a record of all members and officers of the congregation with a brief history of the church’s mission work and the steps taken with a view to build the church, the name of the contractor and the building committee, a copy of the 1922 minutes of the Augustana Synod, a copy of the Sunday School paper “The Olive Leaf”, the name of Rev. Gustav Andreen, president of Augustana College and Theological Seminary in Rock Island, IL who officiated at the laying of the cornerstone, and a few new coins. The program included the singing of the hymns “I Need Thee Every Hour”, “Rock of Ages Cleft for Me” and “My Country “Tis of Thee”. By December, 1923, the dedication was held. The Basement Church--Altar with Rev. Sater and others. Through suppers, rummage sales, and membership dues, the Ladies Aid was able to give $491.65. The Luther League collected funds from waffle socials, dues and box socials and was able to give $125.00 to the building fund. The Sunday School was organized on December 29, 1918 with one pupil - Walter Lindell. The Sunday School bought the baptismal font in 1929. With the end of World War I, the United States entered an era known as “The Roaring 20’s”. The 19th amendment to the constitution in 1920 gave women the right to vote. Women could actually swim in public in bathing suits, but strict rules prohibited white or flesh-colored suits, armpits had to be covered and the bathing suit skirt could not be shorter than four inches above the knee. A five day, 40 hour workweek for factory workers was adopted. Wonder Bread, Wheaties, Kool-Aid, Gerber baby foods and Milk Duds began to appear on store shelves. Popular songs included Tiger Rag, 12th Street Rag, For Me and My Gal and M-O-T-H-E-R. The Girl Scouts started the annual tradition of selling cookies. The 1924 church directory lists 84 names. Married couples were listed as Mr. Anderson and wife or Mr. Johnson and wife, women rarely listed by their own name unless single or widowed. Pastor Sater continued to serve the Lansing church. The congregation was finally able to pay him a salary of $300.00 per year and the janitor $5.00 per month. One member of the church was authorized, in July of 1929, to buy a scythe to cut grass on the lots around Grace if he could get it at a “reasonable price”. In 1930 at the age of 75, Pastor Sater retired. With the year 1929 drawing to a close, the Great Depression hit the United States. A woman’s winter coat cost $28.00, a man’s shirt $1.00, a child’s doll $1.95 and a gas stove $19.95. Many people were jobless. A production worker earned $16.89 per week, a doctor $61.11 per week and a cook $15.00 per week, if you were fortunate enough to be employed. May 19, 1930 was a bright day in the bleakness of the Depression and put Lansing in the spotlight. The famous Morlok quadruplets were born at Edward W. Sparrow Hospital. Their names came from the initials of the hospital: Edna, Wilma, Sarah, Helen. They were listed several times in the Guinness Book of World Records as the oldest identical quadruplets. Grace’s second pastor, Reuben Kron, arrived. 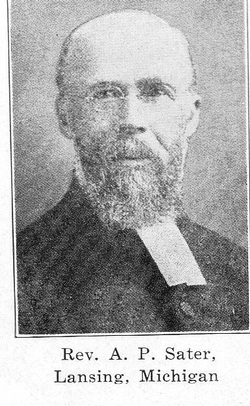 Pastor Kron served from 1930 - 1937. Pastor Lundquist served Grace Church for 4 years and left to enlist as a chaplain in the Navy. In 1940, church membership was composed of 54 men, 66 women and 36 children. Grace Church was without a resident pastor. During the Christmas holidays, Rev. Olaf Nelsen and his son helped for one year. Pastor Sater helped out as well. Then a theological student, John E. Johnson, was appointed on February 18, 1943 to serve until a regular pastor came. He left Lansing in the fall to finish his studies at the seminary. Student Arnold Olson served during this time. The Sunday School was reorganized. And John E. Johnson was called to be the fourth resident pastor. John E. Johnson had changed his name and returned to Grace Lutheran as Pastor John E. Breck on August 12, 1944. He served until 1959. The United States entry into World War II began after December 7, 1941, the day that Japan bombed Pearl Harbor. Oldsmobile detoured from the auto industry. The company’s wartime workforce of 11,000 made artillery shells, rockets, guns and parts for aircraft engines. On November 15, 1942, the church’s 25th anniversary, 5 members were in the armed forces: Kenneth Bennetts, Robert Leaf, Jr., Kenneth Mattson, Howard Sandin, Carl Smith, Jr.
…We each have unique experiences and while I don’t remember it, my first experience with Grace Lutheran Church was in 1945. I was born during World War II and my mother’s sister was to be my sponsor but she was an Army nurse in England so I was told my baptism “sponsor” was Grace Lutheran Church…. During the years that Pastor Breck served Grace Lutheran, the Daniel Boone Patrol of Grace Lutheran Troop 89, Explorer Post 389, a young married couples club called The Two - Or - One Club, and a choir for grade school youth were organized, helping the church achieve the goal “every member in some organization”. 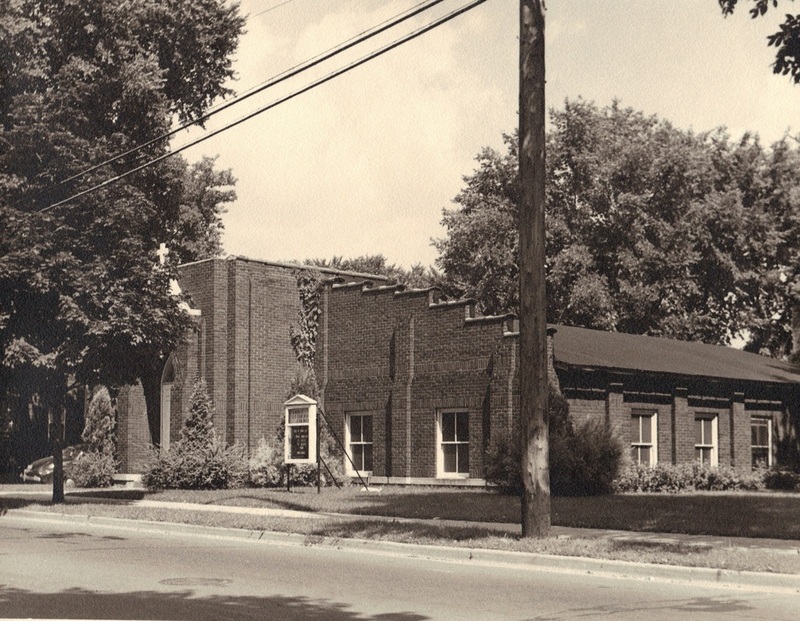 The mortgage for the basement church was burned on December 30, 1945 and the congregation approved a $40,000.00 expansion plan for a building program to erect a sanctuary above the existing basement. Plans for the new church were drawn by Elmer J. Manson. An article in the Lansing State Journal dated September 26, 1948 stated “ the new sanctuary will provide seating for 152 persons and another 50 will be accommodated in the choir loft and in auxiliary seating. The steeply pitched roof supported by laminated wood scissors trusses suggests a spirit of worship. The sanctuary is designed so that the main lines will converge at the altar. A large dossal hanging will provide a restful background which will receive special lighting.” Since construction would begin at least 6 feet off the ground, it was impossible to have a groundbreaking ceremony. Some consideration was given to a ceremony of “raising the roof”, but that was ruled out as well as the contractor planned to leave the present roof intact until the new walls and roof were built. Celebrating the laying of the first brick was the congregation’s only choice. And the Ladies Aid provided refreshments. Ostkaka (Cheesecake); Mrs. Amos Lundquist made spritz cookies using this Swedish recipe: Spritz; The last featured recipe was for Pepparkakar by Mrs. Mary Binder: Pepparkakar. With the help of a 100 foot boom crane used to support the trusses, the new sanctuary construction was completed by October 15, 1949. Moving in was delayed several weeks as the congregation waited for the delivery of pews and chancel furniture and a special carved stone above the entrance, bearing the symbols of the four evangelists gathered around a Maltese cross. The sanctuary was dedicated on Palm Sunday April 2, 1950 after worshiping in the basement for 27 years. Total cost of the project was $35,000 plus $10,000 for furnishings and a newly installed Wurlitzer electronic organ. The chancel was dedicated to the memory of August P. Sater. 18 living charter members still on the church rolls were honored during the church’s 33rd anniversary on November 26, 1950. A booklet from the 1947-1948 Two-or-One Club shows that the purpose was to promote Christian faith and fellowship, to help assimilate new members into the life of the parish and to support and encourage the general program of the church. Members had to be at least 18 years old. Dues were $1.00 per year. Some of the planned events were: a steak fry, progressive dinner, Valentine dinner, Easter party, potluck dinner, guest night, Christian parenthood night, and scavenger hunt. If you look at the “No Parking” signs on Lapeer Street, you will notice that they have a smaller sign on top that exempts the no parking ordinance on Sundays. In a Lansing State Journal article of March 22, 1955, it was reported that Grace Lutheran Church members were receiving parking tickets while parked on the street to attend church. When the alderman for the area brought up the issue at the next city council meeting and suggested that the police be directed to be lenient on Sunday mornings in that area, or perhaps the tickets themselves could be fixed, the alderman from the St. Mary’s Catholic Church district asked that the same courtesy be extended to his constituents, who also were receiving tickets on Sunday mornings while at church. An alderwoman spoke up and said that she would expect the police to enforce the laws of the city. After some verbal wrangling, Judge McDonald, local magistrate, spoke and said that if he was expected to fix parking tickets, he wanted it in writing so his “skirts would be clean”. Mother-Daughter Banquets were popular events. Themes varied from “Lullabies Around The World” to “Our North American Neighbors and Alaska and Hawaii” to a series of tableaus on the theme of “Seven Ages of Women”. The men of the church worked the kitchen detail that evening. Menus were carefully worked out by the committee and varied from Swiss Steak with mashed or whipped potatoes and gravy to ham with scalloped potatoes, accompanied by rolls, coffee and milk, and the Lutheran stand-by - molded salad. Lutherans found the joys of Jell-O to be irresistible and included it frequently on any menu. The church men organized on February 28, 1957. As you can guess, they had banquets, too. By January, 1955 the church was able to burn the mortgage on the sanctuary and approved an $85,000.00 Parish Center addition to provide Sunday School classrooms, nursery, administrative offices, library-classroom, organization room, choir rehearsal room, storage and restroom facilities. Groundbreaking for the new center was held on May 22, 1955. And by May 6, 1956, the dedication for the new parish center was held. On January 23, 1956, the Women’s Guild reorganized with four circles and the Ladies Aid Society and Women’s Missionary Society passed out of existence. The women’s groups continued with a successful plan for raising money and… you guessed it, it involved food. “Salad luncheons” were hosted each spring and fall. A Saturday evening banquet was a part of the celebration for the church’s 40th anniversary on November 23, 1957. Some of the charter members dressed in clothing styles popular about 1917. Esther Sater was driven to the church in a REO Touring car; others came in 1906 and 1932 vintage cars and a brand new Olds, representing present and future opportunities. In the mid-1960’s, under the sponsorship of the Women’s Guild, Barbara Klefstad, Edna Mathiasen and Karla Chamberlain (then Mathiasen) compiled, printed and sold a recipe book entitled “Eating With Grace”. The price was $5.00. The recipe book was a big success and later additional recipes were printed and sold. Each circle also had it’s own rummage sale to earn money for church projects. $2,450.00 worth of kitchen alterations, funded by circle projects, were completed in September, 1958. The youth in the church were not forgotten. The Luther League continued to be very active in Grace Lutheran Church activities. On Saturday, May 3, 1958 Grace Lutheran Church hosted more than 200 Luther Leaguers from Augustana Lutheran Churches in lower Michigan. The afternoon sessions included Bible study and a study of the new and recently introduced hymn books and liturgy. President of the Eastern district Luther League was Larry Foster. President of the Grace Lutheran Luther League was Diane Tullos, Ethel Luoto was in charge of the book table, Jim Shutes took care of the physical arrangements and Milton Bloomquist handled registration. Sunday School was a vital part of life in the church for youth. Pastor Breck accepted a call to Rock Island, IL in 1959. Once again, Grace Lutheran was without a pastor. Dr. Joseph Anderson served as supply pastor. During this time, congregational participation in the worship service increased. Hawaii and Alaska were admitted to the United States in 1959. Pastor C. Oscar Leonardson arrived in 1960 and served until 1970. In January, 1961, Grace Lutheran Church hosted the newly elected 40th state governor John B. Swainson at a 7:30 AM service before he and his family attended inauguration festivities later in the day. Also attending that service was G. Mennon “Soapy” Williams, outgoing governor. The Augustana Lutheran Church went out of existence on December 31, 1962, merging with three other national churches to form the new Lutheran Church in America. The 1960’s were busy times for the church. Property south of the church was acquired and landscaped, property at 1003 W. Lapeer acquired, the parking lot east of the parsonage refurbished, new carpeting and dossal curtain installed, and improvements made to the Audio-Visual, Social and Fireside Rooms. The 50th anniversary of Grace Church was in 1967. The festivities began with a banquet on December 1st at Central United Methodist. The speaker was Dr. Harold E. Sponberg, president of Eastern Michigan University and a former member of Grace Lutheran while on the faculty at MSU. At the Sunday services on December 3rd, special guests were Pastor and Mrs. Kron, Pastor and Mrs. Lundquist and Pastor and Mrs. Breck and sons. Holy Communion was celebrated at the 9:30 AM and 11:00 AM services, with coffee between services. A special afternoon program at the church at 4:30 PM featured guest speaker Rev. Dr. Frank Madsen, president of the Michigan Synod of the Lutheran Church in America, speaking on the theme “Thanksgiving and Courage”. There was reminiscing about the church and a piano solo by Karla Mathiasen, with a light supper and fellowship following in the social parlor. On July 24, 1969 Neil Armstrong reached the moon. Edward Baker and Roger Bergh were installed as deacons in 1969. They were the first to be elected while still in their teens. This was an effort by the congregation to become more youth conscious in its approach to the problems of the day. On April 13, 1969, Grace Church issued a call for an assistant pastor. One of Grace’s own, Larry Foster, was ordained May 20th and began serving Grace Lutheran on July 1, 1969 as an assistant pastor. Larry entered the ministry after a career with the Detroit Tigers. A pipe organ, with seven ranks and 450 pipes, was ordered from the Temple Pipe Organ Company in Burlington, Iowa. A dedication on February 8, 1970 accompanied a recital by organist and choir director Claire Lauchner. The 1970’s were a time of unrest in society. Protests against US involvement in Vietnam were reported almost daily on the television. One of Grace’s own - John Cotter - was killed in Vietnam and the sanctuary light was given to the church in his memory. In 1973, the church council borrowed $6,300.00 to raze the house near the parking lot and to refurbish the Social Room. Grace Lutheran voted in 1975 to participate in the newly established Capital Area Lutheran Cluster (CALC). One of the projects of this group was the establishment of the Food Bank. Pastor Foster accepted a call to Lebanon Church and left in 1975 for Whitehall, Michigan. Pastor Alan W. Kamens was called to Grace Church and arrived February 8, 1976. …Our first son, James, was born February of 1976 and was the first baptism for Pastor Alan Kamens in June of that year. Baptisms of our sons, Joel, in 1977 and Jason, in 1980, were also held at Grace by Pastor Kamens. It was shortly after Jason’s baptism that our family moved and our membership was transferred to Advent Lutheran in Arlington, Texas…. Grace Lutheran members and friends have remained busy and involved from the late 1970’s to the present, from a successful effort to preserve the neighborhood from a highway development that would have displaced many families and divided the community to a tutoring program for neighborhood children, still running presently, started by Pastor Kamens and Karla Chamberlain in the mid 1980’s. Grace supports a summer day camp for church and community youth for one week each summer. Themes have included studying people and cultures from Scandinavian countries and Australia. Participants also are involved in art activities, field trips and swimming events. Each day closes with a meal. Renovations to the building, an addition of an elevator, barrier-free restrooms, and a re-designed chancel to make the communion rail accessible to those with physical challenges culminated on September 14, 1986 with the dedication of our barrier-free building. Advent House Ministries, located at nearby Westminster Presbyterian Church, is a program to serve homeless people in the area. It also provides a week-end meal program. Grace Lutheran members prepare and serve food once a month. Grace Lutheran Church was and remains an active participant in the Greater Lansing Housing Coalition and Habitat for Humanity, serving the neighborhood of the church by participating in building or rehabilitating existing homes for a lease to purchase program serving lower income families. Members of Grace Lutheran helped organize and remain active in the Neighborhood Watch program, helping to combat crime in the area. Kurt Peterson and Eric Miller, two young men from Grace Lutheran, completed seminary studies, became ordained ministers and serve Lutheran churches. Grace Lutheran Church recently and successfully completed a pledge drive for funds to replace the original roof over the Parish wing and to reconfigure the entry stairs at the front entrance. The roof replacement is complete. The stairway is in the near future. On November 24, 2002, Grace Lutheran Church members and friends joined together to celebrate 85 years of faithful service. Now we are more than 95 years of singing and service. We have accomplished many things in the past, but the future is yet to be written. The writing of the history of Grace Lutheran Church has been successful because of the efforts of many people. Thanks to those who submitted remembrances in writing, by e-mail, tape or interview. Thanks to the members who compiled scrapbooks of pictures, programs and newspaper articles. Thanks to photographers who visually recorded important events in our past. Thanks to those who offered encouragement.